We Filipinos love bringing tons of cash, to the joy of pickpockets and holduppers. At the mall for example, we prefer transacting in cash instead of just having our card swiped at the counter. The inconvenience. We fail to take advantage of the benefits of cashless society because of misconceptions and lack of information. This is also true when it comes to credit cards. I have been a Bank of the Philippine Islands (BPI) client for years and for the most part, I was like everybody else. Every out-of-the-country trip, I go to my bank, buy dollars and have them exchanged in the local currency upon reaching my destination. Part of the fun, but also part of the hassle. In our recent China trip, we tried something different. Sure we still brought with us dollars, but in China, you get charged per transaction when exchanging dollars. So it's not the amount that you exchange but how many times you do it. In short, it is not practical to exchange small denominations multiple times. Once at your destination, you need a small amount of local currency for the airport-to-hotel transfer and other small purchases and the significant difference in exchange rate at airports means it is not the best place to have all your money exchanged. That is when your credit card becomes handy. 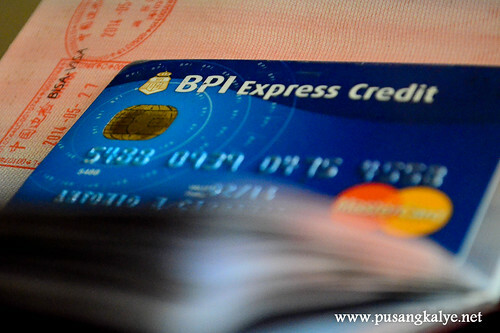 We have BPI Express Credit but other than using the credit card to book flights, we were hesitant to use it abroad. I was worried I might get charged high on foreign conversion or incur hidden charges. That is about to change. I learned that using your BPI Express Credit here and abroad is actually safe, practical and convenient. 1) BPI Express Credit have the lowest foreign exchange conversion rate of only 1.75% among the top 8 surveyed Credit Card Association of the Philippines (CCAP) banks. Other banks charge up to as much as 3.525%. That said, you can save up to PHP1,172 for every USD1,500 purchase. Just choose the currency of the foreign country you're in to automatically enjoy BPI's lowest rates. 2) Also, you get free comprehensive travel insurance when you charge your travel fares to your BPI Express Credit. No payment/premium required. In fact, BPI Express Credit offer a more comprehensive travel insurance coverage from life, health and other travel inconveniences with competitive pricing versus other credit card companies. BPI Express Credit give you automatic protection from travel accidents, trip delays, trip cancellations, and other inconveniences both for domestic and international flights. All cards qualified for travel insurance have the following covered at different amounts: from death and permanent disablement, medical reimbursement, lost or delayed baggage, cancelled or delayed flights, personal liability, and even lost passports. This means the widest coverage. In short, the benefits of using your BPI Express Credit doesn't end with your flight bookings and the travel insurance you get from it. The lowest foreign conversion rate abroad makes it a hassle-free choice in any transaction during your trip. And with BPI EXPRESS CREDIT accepted anywhere in the world, it is no doubt your practical and reliable domestic and international travel companion.